The Department of Health Care Services updated the Coordinated Care Initiative Physician Toolkit to provide physicians with information about how the Coordinated Care Initiative (CCI) is changing health care for dual-eligible patients. The updated toolkit outlines the coverage options for patients and how these changes could affect the billing process, care coordination, and other aspects of a physician’s practice. In 2016, DHCS worked with stakeholders to develop a comprehensive strategy to improve the CCI and increase enrollment. This updated toolkit reflects the resulting recent program changes, including an extended continuity of care period. 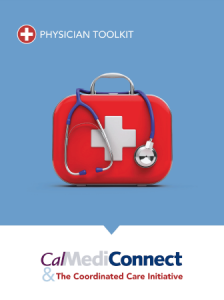 Robust provider outreach and education is a core part of the design and implementation of the CCI and Cal MediConnect. This toolkit can be a resource for health plans, advocates, and community organizations. DHCS continues to update and develop new tools to use in outreach and education activities for providers.